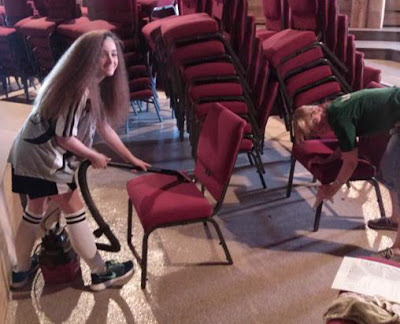 Putnam County Playhouse: SPRING CLEANING TIME! 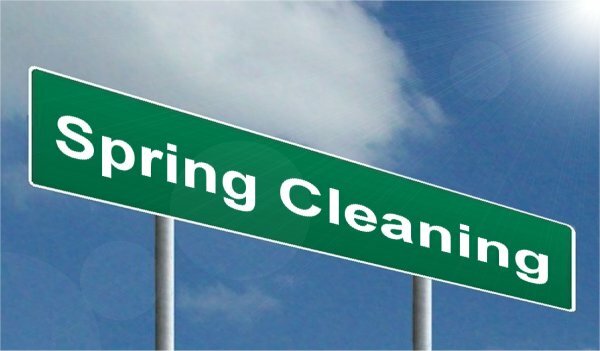 We all enjoy spring cleaning, right? Well, at least we try. It's the same here at the Hazel Day Longden Theatre. 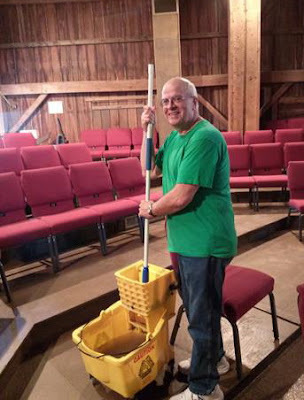 We have to get our facility ready for 198 guests 31 times each season! Our volunteer board of directors and hard-working friends spend many hours getting the theatre ready for YOU! Our first cleaning day of the season was Saturday, April 16. One of the first orders of business was re-hanging the name on the front of the building. Linda Gjesvold redid and repainted the letters over the winter break. 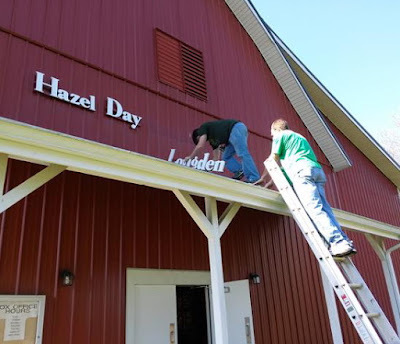 PCPH Board President Mike McClaine (on the ladder) and Board Member Dustin Bond worked on this project. Mike oversees all board activity and will be playing percussion in the band for Little Women. Dustin is the Tech Committee Chairperson. He directed The Game's Afoot last season and is appearing in Little Women. Board secretary (and new first-time Grandmother) Kathryn Dory worked to clean up the lobby. 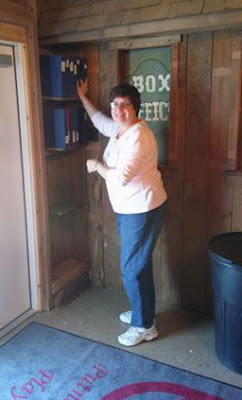 She also placed the photo albums back on the shelves. 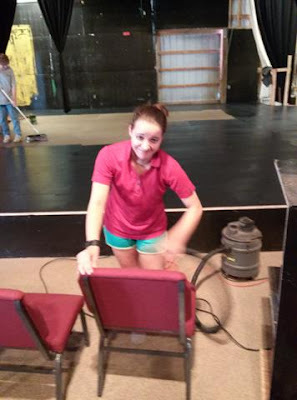 Kathryn is also chairperson of the House committee which organizes the staff for the sale of refreshments for each show and keeps the place clean for each production. She also works on the plants and flowers. Kathryn will also be vocal director for this season's 1776! The tech loft always needs special attention. 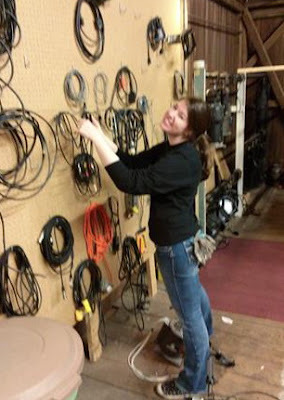 Board member Meghan Armitage made sure the extension and light cords were in order. Meghan is playing "Meg" in the June musical Little Women. PCPH techie Hillary Johnson worked to clean the dust off the chairs. 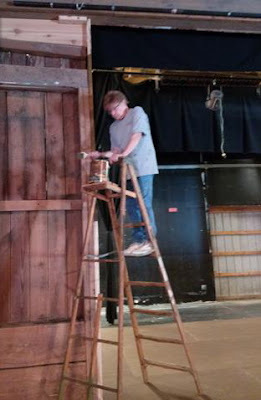 In the background, PCPH Vice-President Linda Gjesvold is painting the surface of the newly remodeled stage. The performing platform had not been redone since being installed in 1983. This winter, a new surface was added, and the side platforms were enclosed! Linda also worked to stain the new proscenium. 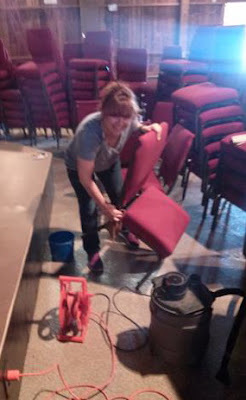 She also worked over the winter to stain the risers that hold all of the chairs. Linda serves as the Shop Manager and is also the chairperson of the Ticket Committee, so this is her busiest time of the year. Board member Caroline Good (right) and daughter Fiona use a shop vac to get the chairs ready for placement. Caroline is the creator of our popular Youth Theatre Workshop SHAKESPEARED! She also conducts the Children's Theatre Workshop annually. Caroline was in The Game's Afoot last season and is assistant director for Little Women this season. PCPH techie Melissa Green unstacks the chairs prior to giving them a good cleaning with the shop vac. Melissa will be running the lightboard for July's show On Golden Pond. She's also planning for a special role as "Mother of the Bride" for the end of April. PCPH Board Member Jim Green mans the mop to clean up the newly stained chair risers. Jim worked on The Game's Afoot and was one of the many vicars in See How They Run. His next role will be "Father of the Bride" at the end of April. He is also working as assistant director of Little Women. All of us are excited about our season, and we hope to see you at the barn this year. The time that you spend with us is a result of many hours of volunteer work from our board members, our friends, and the casts and staffs of each of our productions. Please take time to return your Season Ticket order. Our Fund Drive is still active. If you haven't donated yet, you can download a form HERE.